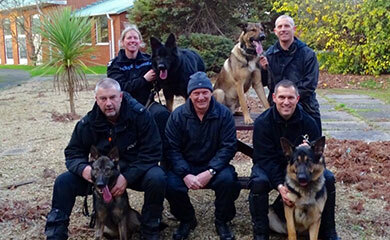 Meet the team’s starting out on their 13 week General purpose Initial Police dog course. Rear left is PS Ali Cruwys with TPD Billy, PC Steve Cruwys with TPD Nato,( formerly Cato) front left Chris Williamson with TPD Bernie, centre is course instructor Hugh Watson and right is Mark Pomery with TPD Ronny. Let me introduce the teams to you. 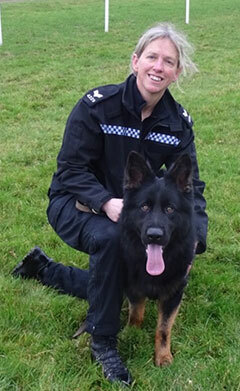 PS Ali Cruwys is the dog section supervisor for the Plymouth and Ashburton Police dog sections. Her old Police dog Bodie recently retired and will now live out his retirement with Ali and her family. Billy was bred by our regular breeder John Smith in Barrowden and was puppy walked by Sue and Nigel Davey in Exeter. Here he is as a young puppy. He is doing really well on the course particularly with his tracking. All of Ali’s previous Police dogs have been exceptional tracking dogs and Billy looks like following in their footsteps. ( Excuse the pun ) He is still very immature for his 19 months. 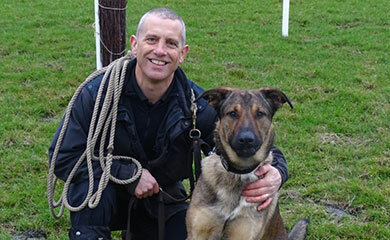 PC Steve Cruwys is a Police dog handler in Exeter and is married to Ali . Should Nato be successful he will be taking over from Steve’s retired Police dog Logan. Three of Nato’s brothers graduated as operational Police dogs on our December 2016 course and Nato hopes to make it a successful quartet. Nato was bred by Drew Rush from Gloucestershire who proudly saw Nato’s 3 brothers graduate on their passing out parade in December and would love to see Nato follow in their footsteps in April 2017. 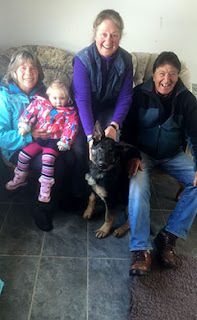 Nato was puppy walked by experienced puppy walker Susannah Coffin and her family. Here he is as a young puppy. Nato is a very big powerful dog who is very bold and self-assured. 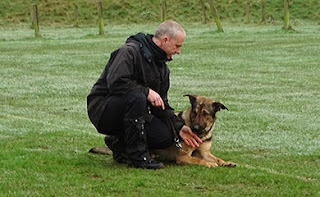 He loves his handler and when Steve puts him back in the big van after he has completed his turn to work and Steve re-joins the rest of the course Nato howls like a bloodhound. Nato is exceptional in all of his work and my advice to criminals is don’t be fooled by the floppy ears you don’t want to mess around with this dog. 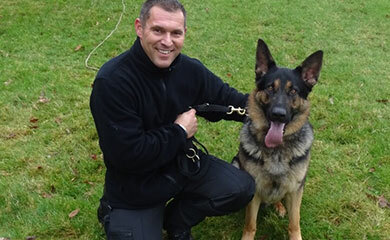 PC Chris Williamson has been a Police dog hander for 16 years and works in Guernsey. 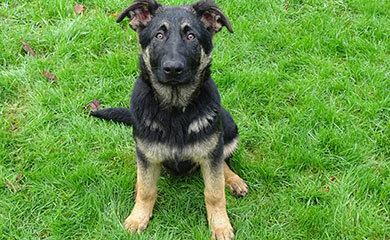 Bernie was bred by Paul Jones who recently moved to Lostwithiel after spending 7 years in Germany and prior to moving to Germany provided a number of Police dogs for Devon and Cornwall Police. We had to release his brother Bob because he found it difficult to cope on different types of floor surfaces. 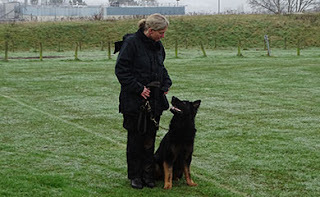 Bernie also had the same issue but not to the same extent of his brother and is doing really well on all exercises on his course. 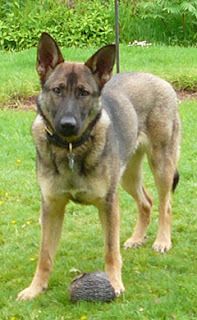 Bernie is a feisty, high energy; independent young dog that we must be mindful he is only 13 months old. 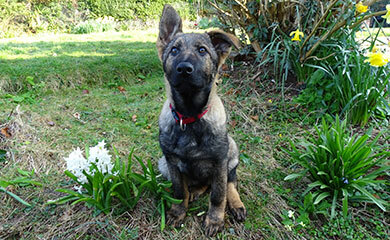 Also because his handler Chris flies home to Guernsey each weekend Bernie goes back to his puppy walker Paul to be looked after at weekends. 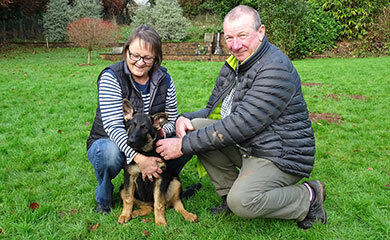 We are grateful to his puppy walker Paul because it means that Bernie can relax and rest at weekends which are vitally important for him after an intensive week of training. 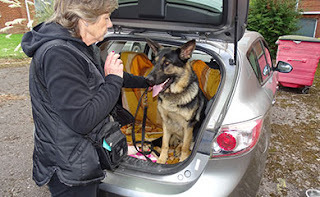 It will be disruptive for Bernie coming back in each week to be reunited with Chris but we will monitor the situation closely and hopefully after a few weeks he will settle into the routine. 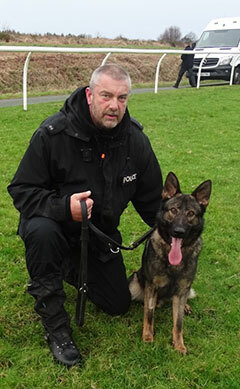 PC Mark Pomery is a novice Police dog handler with his new dog Ronny. 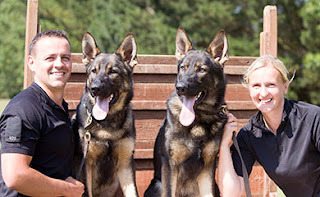 If successful Mark and Ronny will be working at Bodmin Police dog section. 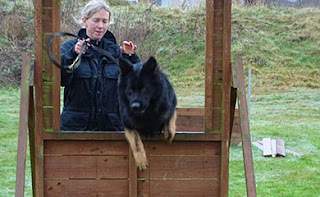 Ronny was bred by Alfons Schulmeister in Hovelriege Germany. 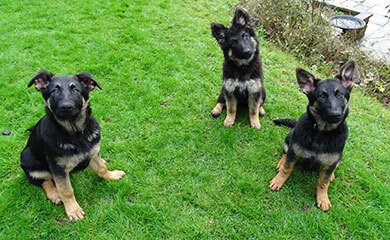 Alfons also bred our latest 3 puppies Tammy, Tag and Tara who I collected 2 weeks ago and featured in our last blog. Ronnie was initially puppy walked on a temporary basis by experienced puppy walker Annie Miller while we found a full time puppy walker. He was then puppy walked full time by experienced puppy walkers Jill and Terry Hodge. 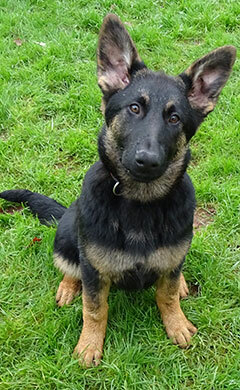 They are also now puppy walking new pup Tara. 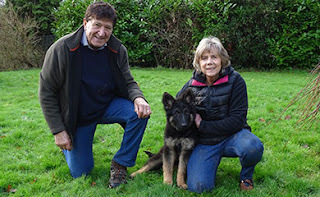 Here is Ronny pictured with Annie on the day Terry and Jill with their granddaughter collected Ronny from Annie’s home. Ronny is a big powerful dog with a lovely nature and very strong working drives. 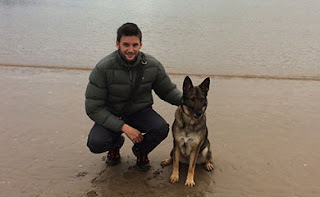 Ronny is one of those dogs that take everything in their stride and is a pleasure to own and be around. 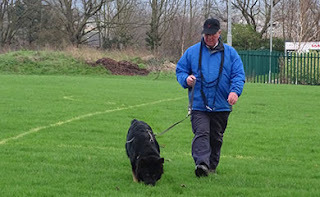 He and first time handler Mark are well suited and are doing well in all aspects of the course. So after nearly 2 weeks all 4 teams are doing well. The course is great fun for the dogs but is physically and mentally very demanding. 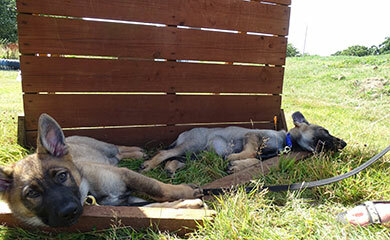 At weekends it is important that the dogs just relax and get plenty of rest to recharge their batteries for the next weeks training. 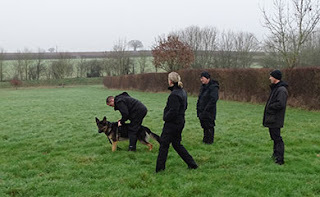 I love seeing the young dogs start their Initial course training but I never forget what a huge part our puppy walkers have played in preparing these dogs for our courses. As a result of their hard work our dogs arrive fully socialised to all everyday life experiences. They have covered basic control exercises such as sit stay, down stay, basic agility, tracking, article searching, puppy tugging, recall, and to remain in the vehicle until the lead is attached and the jump down command is given. 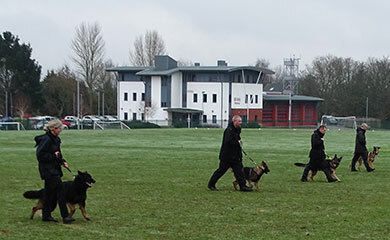 The course will cover a wide range of exercises and skills which includes tracking and searching for outstanding criminals or vulnerable missing persons, dealing with violent offenders, disorderly crowds, agility, searching for outstanding articles, and a wide range of control exercises. Bernie is pictured here in the early stages of learning to negotiate an obstacle. Billy is pictured here negotiating the window obstacle. 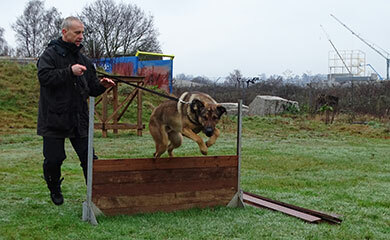 Eventually the dogs will need to negotiate a 3 metre long jump and a 2 metre high obstacle. 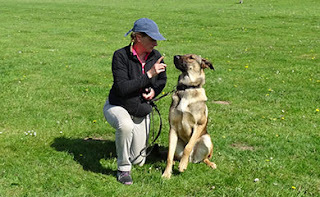 Control work is probably our most important work and is practised daily. 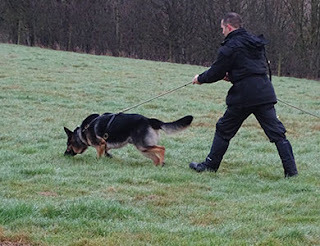 This will include the dog being able to walk in a controlled and relaxed manner alongside the handler, a sit stay, a down stay for 5 minutes with distractions, emergency recall from practical situations, releasing a toy on command, releasing an offender detained by the dog on command and return to the handler. Here are the teams in the early stages of group heelwork. 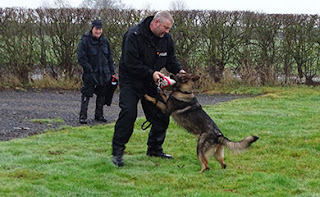 Here is Steve in the early stages of the down stay with Nato. In Dorset, Devon and Cornwall we have a large number of elderly residents and we spend a lot of time searching for elderly vulnerable missing people. 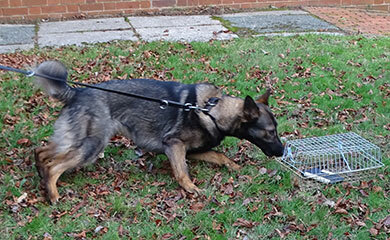 Very often they are confused and can attempt to push the dog away when located. That is where our puppy program pays dividends. 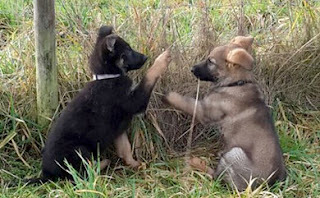 Because of their balanced temperaments and the wide ranging socialisation program they undertake with their puppy walkers they are unlikely to attack or bite anyone unless there is a very good reason. Nato is pictured here in the early stages of learning to bark without being aggressive to indicate he has located a person. The dogs are also taught to indicate any outstanding property or articles bearing recent human scent. This could be lost property or articles that may have been dropped or hidden by a criminal. We don’t want the dog touching or mouthing the item so as not to interfere with any DNA which could identify the offender. Here is Ronny getting ready to set off on his track. Tracking is the following of a trail left by a person who could be a criminal who has made off from a crime scene or vulnerable missing person we need to locate. Ronny is away demonstrating a low nose in the footprints of the person who left the trail. Tracking probably accounts for a large percentage of our work and so we start their tracking training as early as 3 months of age. Here is Ronny at 5 months already showing good tracking concentration with puppy walker Annie. Bernie was a little wayward starting his tracking on the course and so we reverted to the method we used with him during his puppy training. 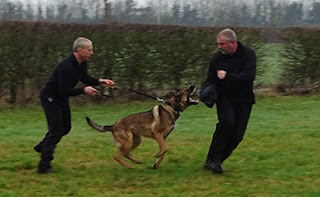 You can see he is going to be a very determined and driven tracking dog. There is no doubt the dogs love their biting work. 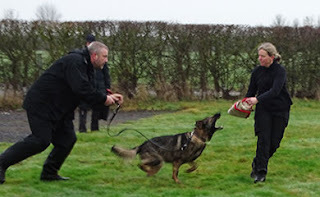 With the advent of the Tazor and the Incapacitate sprays that officers now carry the dogs do not get used in as many use of force situations as they used to. However they still need to protect their handlers and still need to be trained to detain a fleeing criminal who ignores the challenge to stop, or to deal with violent unruly crowds. 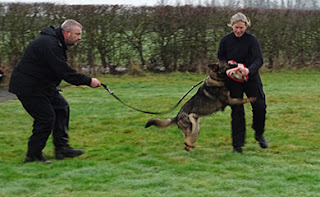 We start with the handler playing with a bite cushion to get the dog used to it and this is then transferred to a helper. 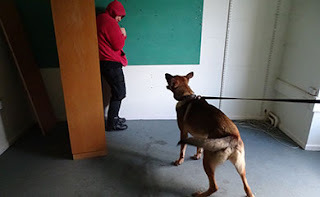 Once the dog gets proficient at biting the bite cushion with the helper we transfer to a protective sleeve worn on the right arm. Pictured here is Bernie going through this first training phase. Pictured here is Nato on a covered sleeve and it is very obvious that he is going to be a very determined and hard biting dog. Well I hope you have enjoyed the blog. Someone on Facebook commented they thought the blog last time was a bit layman which I thought was a bit unfair. I do the blog voluntarily in my own time and try to keep it simple but informative. I’m more than capable of using all the training buzz words and sounding very knowledgeable and clever but unless you inform me different I will leave it as it is. I will update you all on the course at the halfway stage. My first job of 2017 was to travel to Hovelhof in Germany the home of my friend Alfons Schumeister to collect our latest pups for our puppy program. 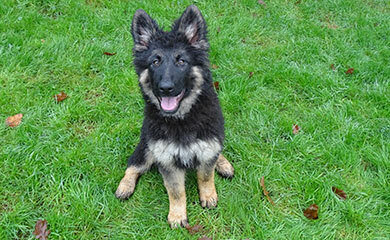 Alfons is a small family German shepherd breeder who has been breeding for over 30 years under the kennel name of Moosheider Teich. Here they all are in my kitchen after their 2 day journey via Calais and Dover and I never had a peep out of them throughout the trip. The pups are now 4 months old. Let me introduce them to you individually. 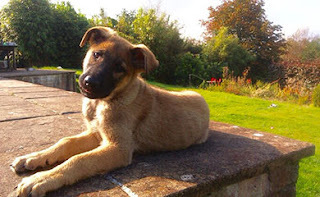 Tag is a very chilled laid back puppy who doesn’t get too excited about very much in life. That all changes if you get a toy or a ball out then he goes into overdrive. Tammy is a very highly driven dog who plays extremely hard and is very determined. She has not had the level of socialisation that the other 2 have had and so that will be the main objective for her over the coming months. We found out 2 weeks ago that Tara had a small umbilical hernia and so I had decided not to purchase her. The reason I wanted to purchase 2 females was because we are looking for a future breeding female. An umbilical hernia tends to rule out future breeding as the experts tell us it is a genetic fault. However once I saw her character and infectious personality I was smitten and had to bring her back. Her tail never stops wagging and she meets everything in life head on. 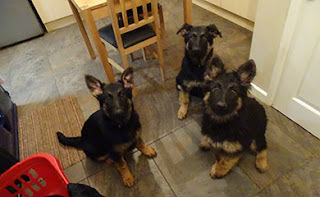 Once I got the pups home the plan was for them to stay with me for 2 days to give me a chance to evaluate their characters and personalities before going to their puppy walkers. As always our girl Sasha wanted to mother them all and took them under her wing. 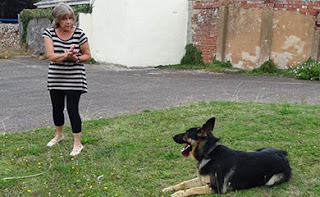 Obviously while I was away in Germany I couldn’t expect my long suffering wife Di to look after them all and so Lenny and Rudi had to go into kennels for a few days. 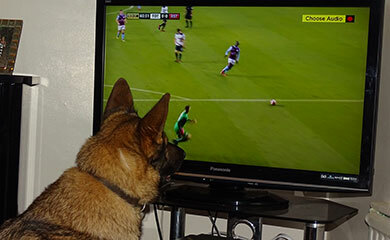 I knew that Lenny would cope but I was worried about 7 month old Rudi because of his age. I needn’t have worried apparently he had a great time. I really enjoyed having the 3 pups but after two days together it was obvious that Tammy, Tag and Tara needed to go to their puppy walkers because their play together was becoming much to rough and aggressive. I could see them injuring themselves with the speed they were charging around the garden. 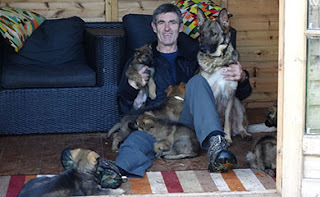 I have had a number of people wondering why I have been travelling to Germany to collect pups. In 1994 When I was a Police dog Sgt I took 3 of my dog handlers to the Westfalen Police dog training centre in Germany which is responsible for over 350 Police dogs. The visit was very informative and I have maintained contact with one of the head instructors Werner Rapien ever since. Through Werner I have got to know Alfons who has provided several excellent dogs to our dog section. 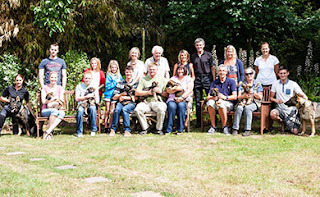 It is difficult obtaining enough good quality pups in the UK which have the qualities we are looking for and so we are hoping that by going to Germany we can supplement the pups we acquire in the UK. 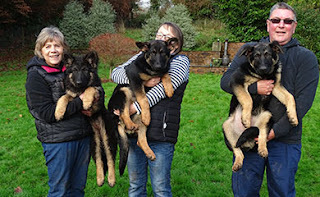 On Sunday 8th January our puppy walkers arrived to collect their pups. 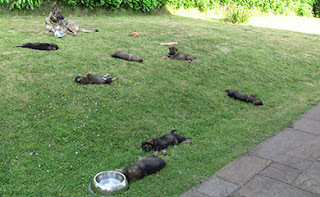 We all had a great time with the pups running around and Sasha didn’t need a second invitation to join in. Looking at how calm and relaxed the pups are here being restrained by people they have never met before indicates to me that they all have very good characters. No sign of panic or stroppiness which bodes well for the future. Terry and Jill will be puppy walking Tara. 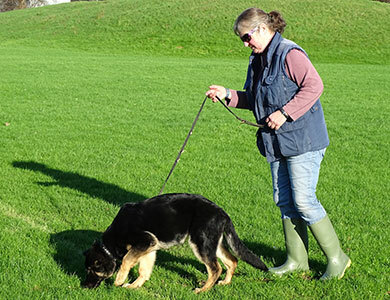 They have only just finished puppy walking Ronnie who was also bred by Alfons and he will be on the January 2017 Initial Police dog course starting this week. Nigel and Sue are temporary walkers for Tag who will be going to his permanent puppy walker in 2 weeks time. 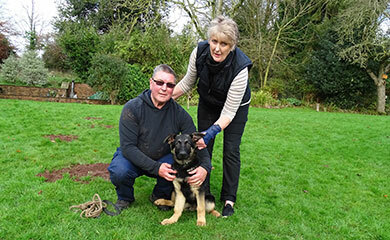 Nigel and Sue puppy walked Billy who is also on the 2017 Initial Police dog course. 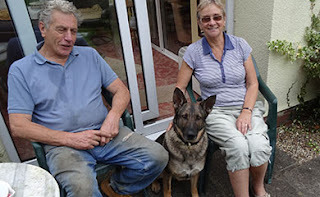 Angie and Graham are also temporary walkers for Tammy who will also be going to her permanent walker in 2 weeks time. 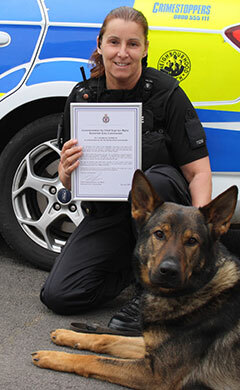 They puppy walked Reggie who passed out as a Police dog in December last year. We are extremely grateful to Angie, Graham, Nigel and Sue for helping out while we fully vet the new walkers of Tammy and Tag. One last photo and away they all went. I'm looking forward to see how they all develop and we will keep you all informed of their progress. Prior to Christmas I made the decision to retire Ruby from our breeding program. It was made mainly because we had during her two previous seasons experienced difficulties getting a successful mating and having more than done her part for our program I felt it was best for her and her Carer Mark. Ruby has been a very important part of our small breeding program having had two litters the A & C litters both with 7 pups and both litters consisting of 3 males and 4 females. Of those 14 pups 10 have gone on to become licensed operational Police dogs. 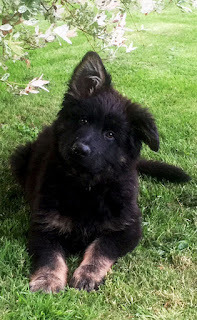 We purchased Ruby as a puppy in 2011 and she is pictured here when she was 11 weeks old. ( Show Pic 13) She was puppy walked by Pauline and Derrick Fisher. 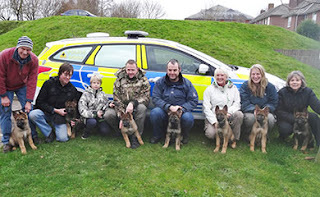 Here are all of the A litter with their puppy walkers about to leave to go to their new homes. 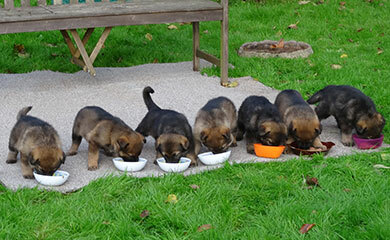 In October 2014 Ruby had her second litter the C litter again at our house. Here they are having a meal outside. 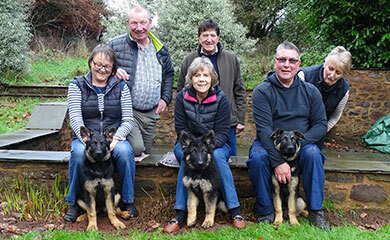 Here they all are with their puppy walkers on our first training day..
As previously stated 10 of her pups have gone on to become operational Police dogs in Devon and Cornwall, Dorset and Avon and Somerset. Here are Mark with Axel & Carla with Arry. 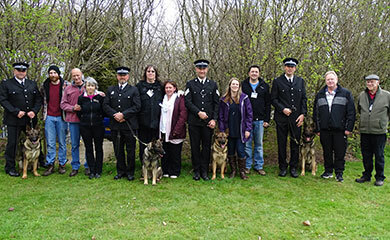 Here are the rest of the A litter on their passing out parade with their handlers and puppy walkers. 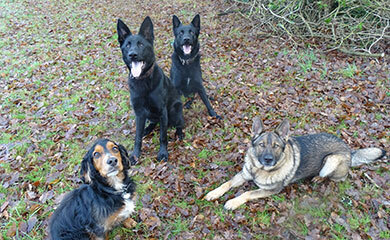 From left to right are Ash, Grommit, Argo, Annie and Ava. 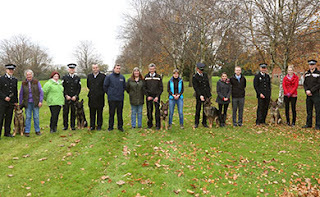 Here are the C litter pups graduating as operational Police dogs on their passing out parade with their puppy walkers and handlers. 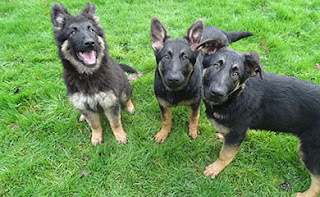 From left to right are Chaos, Charley, Cosmic and Comet. We are extremely grateful to Pauling and Derrick for puppy walking Ruby and also to Mark Fairchild who has been Ruby’s carer since she had the A litter. I didn’t realise just how emotional I would find it to retire Ruby but it is not surprising particularly as I have watched her develop from 8 weeks of age and watched her being the perfect mother to her pups at our house where she raised them. Finally I thought I would finish with a couple of pictures of Sasha our one remaining breeding female just to illustrate just how ball mad she is. 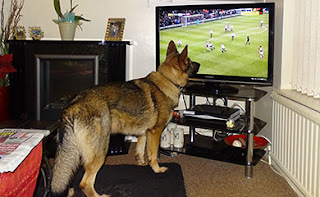 She recently sat and watched the recent Spurs v Aston villa football match hoping the football on the screen would come her way. The January 2017 Initial Police dog course gets underway this week and I will introduce all the handlers and dogs in my next blog.